This large 1350 sq. ft. St. Andrews Common, Palmetto Dunes, Hilton Head Island recently renovated, nicely decorated first floor villa has a wrap around private patio with electric outdoor grill and patio furniture for 6. The living room has a large 31 inch wide LED TV in the master bedroom and it's equipped with a Chromecast stick so you can stream Netflix from your phone. The guest bedroom was just updated June 2018 with a luxury queen size mattress that sleeps like a dream, and a new large capacity washing machine! The unit is near the pool and has 2 cruiser bikes and beach chairs for you to use. No other St. Andrews Common unit is more convenient to get to that this one. Our side door is steps from parking, so bringing in groceries & luggage from your car is so easy- no steps to climb! Guests keep coming back to enjoy our comfortable furniture and wrap around convenient to access patio. FREE WIFI/Broadband works in every room, & the connection is fast! New floor tile was just installed in the dining room and bathrooms last year. Two FULL SIZE bedrooms/2 baths, and a small keeping room with full size fold out sofabed that small children can sleep on- all on one floor. A KING bed is in the master with a private bath, and the guest room has 1 TWIN bed and 1 QUEEN bed with brand new luxury mattress. The guest room is adjacent to a private bath. The sofa sleeper mattresses now have a mattress topper 5/25/14) to improve comfort. There are THREE FLAT screen LCD TVs with cable. A 31 inch wide Panasonic in the master, a 39 inch wide TV in the living, and a smaller TV in the guest room. The living room and guest room have a DVD player, and we have a DVD library for all ages (ask me for the list of DVD's if you would like to know the titles ahead of time). A comfy recliner sits in the living room to kick back & watch the golf channel in. The kitchen has STAINLESS STEEL appliances & a large capacity washing machine and dryer. The washing machine is brand NEW as of June, 2018. 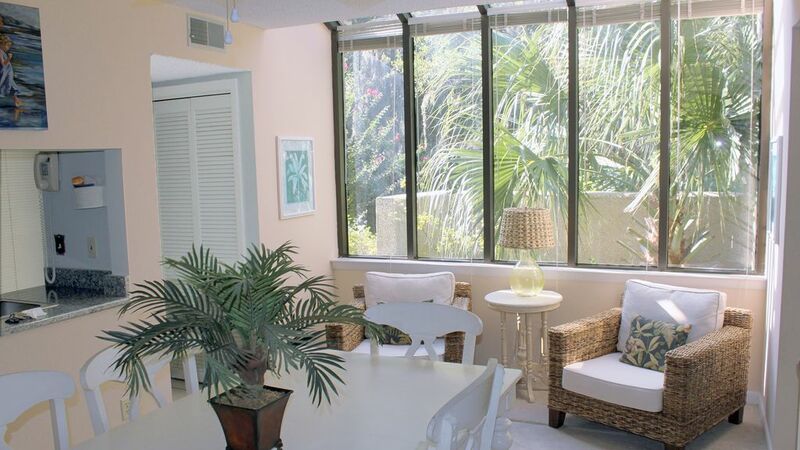 You won't regret selecting this villa as your place to stay in Hilton Head. Ask us about our OTHER WEBSITE that has links to fun places to go and eat on HHI as you plan your vacation. STAY with us and you will see why our place is a favorite by HHI vacationers, and why most of our guests are returning to stay with us again. St. Andrews Common is located just inside the entrance of the beautiful Palmetto Dunes Resort which offers three championship golf courses, an acclaimed tennis instructional program ranked #3 in the world by Tennis Resorts Online,and a variety of restaurants. Experience the luxury and comfort of our spacious floor plan that includes wall-to-wall windows and a fully equipped wet bar in the living room. The adjacent dining room (seats 6) provides lots of sunshine and is perfect for when you feel like staying in and grilling out on our charcoal grill on the patio, (two patio table can seat 6-8 people). You'll enjoy cooking for family and friends in our fully-equipped kitchen that has everything you would ever need! You have many choices! You can relax and grill out with our new electric grill on the private patio, walk just a few steps to a beautiful pool overlooking the lagoon and the 15th fairway of the Championship Fazio Golf Course, golf or just hit golf balls at the driving range! Play tennis or take tennis lessons. Ride bikes, or dine at fantastic restaurants you can walk to. Or shop 'til you drop at the Tanger Outlet Malls to include Children's Place, Brooks Brothers, Eddie Bauer and many more! The beach is a two minute car or FREE PALMETTO DUNES BEACH BUGGY/SHUTTLE ride from our villa. The road to the beach is pleasant, scenic,and shady enough for a safe walk or bike ride.....all inside the Palmetto Dunes Resort. We've been on VRB0 with this Andrews Common villa since 2003. We enjoy helping families and golfers plan their HHI vacation. Hilton Head Island was named the #1 Island in the U.S. and Canada by Travel and Leisure magazine, and #2 in the World! We love the beach, golf,tennis, and everything Palmetto Dunes has to offer. We especially love playing the Robert Trent Jones oceanfront golf course. We think HHI is the perfect place for a family vacation. While viewing properties for sale in 2003, we wanted to buy in a private resort area. Palmetto Dunes was just right for us because it's size is not too big, and not too small. With 2 beach accesses, 3 golf courses and an excellent tennis court facility, Palmetto Dunes was the place for us. We picked St. Andrews Common because the units are clustered in groups of 4 per building, vs. all in one building, which makes it very private. The layout is spacious, and having the wrap around patio & garden makes our place feel more like a second home. We like being close to the pool because it makes it easier to tote your floats, towels, and picnic lunch to and from the pool. The wrap around private outdoor patio is a great place to cook out, relax, read the paper, listen to nature, and just enjoy time being on the island. Bathrooms feature new floor tile and satin nickel faucets, a full tub with shower. The master bedroom has a private bathroom. The guest bath is in the hall right next to the guest room. Full sets of towels and bath rugs, toliet paper, and a small bar of soap are provided in each bath. If you need extra towels they can be provided by the cleaning service, but please make sure to request in advance. This villa in St Andrews Common, Palmetto Dunes is .9 Mile to the 2 beachfronts in Palmetto Dunes you can access. One of the beachfront accesses is owned by Disney and is shared with Palmetto Dunes. St. Andrews Common is located in Palmetto Dunes, a world famous beautiful and private golf, tennis, and beach resort. This villa is approx. .9 mi from the 2 private beaches in Palmetto Dunes. There is a free shuttle that will drive you there if you don't have a car. Contact us for more info on hours it runs. The St. Andrews Pool Deck has a beautiful view of the Tom Fazio Golf Course. The St. Andrews Common pool deck has a beautiful lagoon view. We have a home phone in the unit you can use to make local calls. Sleeper sofa sheets are supplied upon your request. All other linens are included. Parking is available right in front of the villa and on the side. Additional parking is across the lot by the pool. This unit has FAST and FREE Wifi. We have the premium level signal so you can get the fastest connection possible. One full set of towels for each guest staying in the villa (up to 6 total). Please let us know how many sets of towels you will need. There is one small roll of paper towels & toliet paper included. Keeping room small sofa includes pull out full size mattress. There is a dishwasher in this villa and the cleaning service will leave you out one package of dishwashing soap. We suggest bringing a little of your own in case you need to wash another load. There is a stove and microwave in the kitchen and the pots and pans are in a drawer under the oven door. There are pots and pans in a drawer under the oven. There is a microwave in this unit over the stove. The Drip coffee maker is electric and makes a great pot of coffee. The Fresh Market is nearby and we suggest stopping by to check out their fabulous flavors of coffee. Paper towels, toliet paper, dishwashing detergent, and hand soap are provided. There are plenty of dishes and utensils in the kitchen for you to enjoy eating in. Kitchen features stainless steel appliances and granite counters. We keep the kitchen pots and pans updated frequently so our guests can cook or charcoal grill if they prefer. There are a few board games for kids in the living room cabinets. DVD video library is in the cabinet under the living room TV- for quiet time after the beach! Wrap around patio/porch accessible by french doors includes outdoor dining set. A wheelchair cannot access this unit without assistance with a portable ramp (not provided.) There is one step up onto the front porch and one step down into the living room. Pool with large sunny deck that looks over a lagoon & the Tom Fazio Golf course. The pool is open April 1st through October, and is not heated. We loved the place. It is centrally located to everything on the island. Thank you for the 5 star review! We are glad you enjoyed your stay and found our villa to be clean, quiet, and bright with plenty of daylight. The sitting area under the skylight as well as the entire living and dining area does get a lot of light from the wrap around windows, which was one of the reasons we choose this villa when we bought it. Since your stay the carpet has been deep cleaned. We have it cleaned every 4 months, and appreciate your feedback. We have Hargray Digital Premiere Cable, and HD channels are available on the main TV. You just have to scroll through the channel guide to find channels 401-409. Showtime and Epix are also included in the HD channels. Very nice place. Would stay again. Very comfortable bed and furniture. Kitchen had everything we needed. Very spacious with nice light coming in through the windows. Great location and a lovely place, we had a great time! Easy access and all of the amenities. if you just want to get away from it all then this is the spot for you. The condo is quiet, spacious and has bikes provided. There is easy acess to the beach and it’s close to shopping and dining. I highly recommend this as an affordable option for a stay on Hilton Head. Owner was more than helpful in helping with all the details. We enjoyed our trip to Hilton Head. The unit is nice and location convenient.